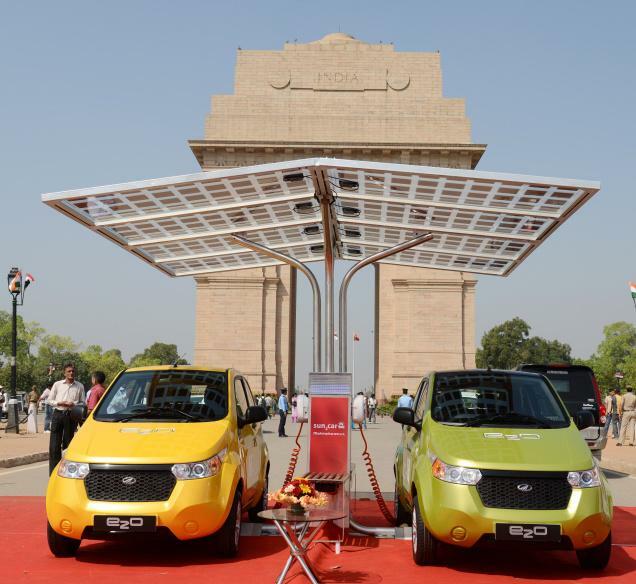 Mahindra & Mahindra Ltd Monday introduced a new electric vehicle, e2o. The car, developed by Mahindra Reva Electric Vehicles (formerly Reva Electric Car Company), is priced at 596,000 rupees (about $11,000) at showrooms in New Delhi. The lithium ion battery powered e2o will replace its predecessor Reva, India’s first electric car. “The launch of the Mahindra e2o marks an important milestone for the Mahindra Group. This is not just about selling a car, it is about helping people to change their lifestyle. We are working at creating an ecosystem that includes mobility solutions along with other environment-friendly innovations,” Mahindra Group Chairman Anand Mahindra told reporters here. The group also plans to extend the electric mobility technology to its two-wheelers. Sales target for the e2o, President (Automotive and Farm Equipment Sectors) Pawan Goenka said, are 400-500 vehicles a month. They expect Delhi to be the biggest market and should account for about 150-200 units. e2o is the first car from Mahindra stable after the acquisition of Reva Electric Car nearly three years ago. It would be produced at the company’s plant in Bangalore with a capacity of 30,000 units annually. The car is powered by a new generation lithium-ion battery combined with a more energy efficient three phase AC induction electric motor with regenerative braking. Charged from any 15A power socket, the battery takes five hours for one full charge and has a driving range of 100 km per charge. The e2o has a single speed gearbox and is aimed at city driving. Other features of the car include a remote charge activated through a mobile application, GPS navigation system, keyless entry. The e2o will be launched in phases across India. In the first phase, it has been launched in eight cities. Prices will vary depending on the subsidy state governments will give to the electric car. The company also plans to export the new electric car to Europe in six to nine months.